Discussion in 'South Asia & SAARC' started by Adil Baloch, Oct 7, 2013. No idea. what do the other forum chaps say. been banned there again. mirage, Zer0reZ, Wolfpack and 2 others like this. QUETTA: Newspapers were not distributed in the city and other parts of the province on Tuesday as hawkers and agents refrained from delivering them due to threats hurled by banned militant organisations. The organisations are demanding the media publish statements about their activities and have threatened to stop distribution of newspapers in any area of the province. Furthermore, a leader of the Anjuman-i-Akhbar Froshan, Yousaf Baloch, has asked newspaper owners not to send copies of their dailies from Wednesday onwards to the market as hawkers will not deliver them to their clients in view of the looming threats. Though newspapers were published in Quetta and were even sent to the market on Tuesday, majority of hawkers and agents did not deliver the editions in the city. However, a few hawkers dared to deliver them in some areas. Besides, transporters also refused to take newspaper bundles to other towns and cities in central, southern and western parts of Balochistan. The Anjuman-i-Akhbar Froshan leader has also asked the media houses of other provinces to stop sending newspapers, while agents have also requested media owners of other provinces not to send newspapers. Meanwhile, the Deputy Inspector General of Quetta has asked the media houses’ owners and editors to publish their editions which he assured would be delivered amid tight security. However, media houses are in a fix whether to publish their editions. A Pakistan defence expert has suggested that the country should consider creating gangs of terrorists and separatists to dismember the United Kingdom and Switzerland for allowing the flagging of ‘ Free Balochistan ‘ posters. “In retaliation, Should Pakistan also create terrorist/separatist gangs in Pakistan who should work to destroy/dismember UK & Switzerland? (sic),” Zaid Hamid, a Pakistani political commentator and defence expert, said in a tweet. “UK is hosting the biggest terror network operating against Pakistan. Altaf Hussain is a British citizen & mass murderer under UK protection,” Hamid tweeted. 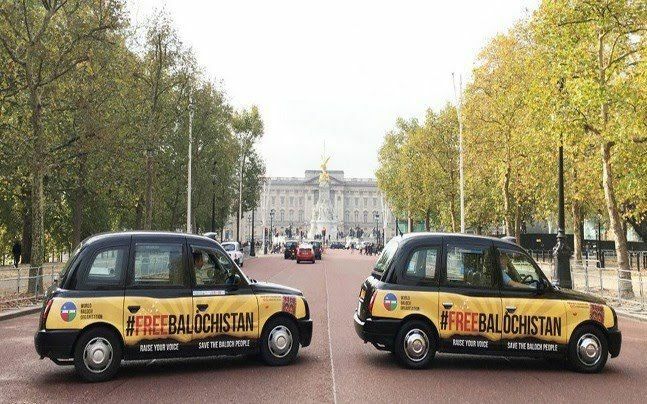 Hamid’s reaction came after London taxis with the words ‘ Free Balochistan ‘ written on both sides were seen plying outside Buckingham Palace in what can be called as a new push by overseas Baloch groups to attract global attention to their cause for independence from Pakistan. ‘Free Balochistan’ posters embossed on several vehicles running on the road were seen in London this week to highlight human rights violations in Balochistan province. Pakistan on Friday summoned British High Commissioner Thomas Drew over the emergence of ‘Free Balochistan’ posters, which it said directly attacked its territorial integrity and sovereignty. A Baloch activist said that Pakistan’s reaction over the posters is a testimony to its suppressive nature, and its aggression to try to curb their rights in the UK. “Pakistan’s reaction is a testimony to its suppressive nature, aggressively trying to curb our rights in the UK, imagine the situation in Balochistan,” Bhawal Mengal? said in a tweet. Earlier, similar posters featuring ‘Free Balochistan’ had appeared in Geneva, including on the side of buses, demanding freedom for the separatist Balochistan region of south-west Pakistan. Pakistan had at that time also summoned Switzerland’s envoy over the display of such posters in Geneva. In addition to this, enforced disappearances, extra-judicial killings and an escalating crackdown on freedom of expression are used as covert tools to brutally repress the Baloch peaceful struggle for justice, rights, and equality. Since the construction of the China Pakistan Economic Corridor (CPEC)has begun, the Baloch have been forcefully cleared, enforcedly disappeared and effectively excluded from the project at all levels – despite plentiful promises made by the Pakistani authorities of development and employment. The 'Free Balochistan' campaign has now found its way to London, with more than a 100 buses carrying advertisements that say "Free Balochistan", "Save The Baloch People" and "Stop Enforced Disappearances", reported ANI. Pakistan is, of course, not happy. The campaign started early this month with posters exposing atrocities committed by Pakistan in the Baloch region being splashed across taxis. It was launched by the World Baloch Organization (WBO) and is gaining strength despite Pakistan's desperate attempts to nip it in the bud. Already, the Pakistan government has complained to the UK envoy in Islamabad. Following pressure from it on the UK foreign office, Transport for London ordered the removal of the advertisement from the city's famous black cabs. Still, on November 13, which is celebrated as Baloch Martyrs Day, the WBO upped the ante and moved its campaign to London's buses. Pakistani officials have labeled the campaign as "malicious" and "anti-Pakistan." This is not the first time a peaceful advertising campaign such as this one has irked Pakistan. "Pakistan's reaction is testimony to its suppressive nature, aggressively trying to curb our rights in UK, imagine the situation in Balochistan," tweeted WBO spokesperson Bhawal Mengal on November 4. QUETTA: Two soldiers embraced martyrdom after an improvised explosive device (IED) went off in Sibi, Balochistan on Wednesday. The martyred soldiers were identified as Sepoy Maqsood and Aqib. Three other soldiers were injured and were evacuated and shifted to a nearby hospital. According to details, the blast occurred during road clearance work carried out by FCSS 130 wing. In September, five security officials were wounded in an IED blast near the border post at Baizai, Mohmand Agency. In February, three personnel, including a Pakistan Army captain, were killed as a roadside bomb exploded near a security vehicle patrolling in Balochistan’s Awaran district. Compared to the casualties IA , the CAPF's & the J&K State Police has been facing these past years , the PA and the Rangers have it pretty easy in Balochistan.If this is the kind of payback we are engineering courtesy NDS or on our own it's a pitiable effort . Compared to the casualties IA , the CAPF's & the J&K State Police has been facing these past years , the PA and the Rangers have it pretty easy in Balochistan. Balochistan is very sparsely populated unlike Kashmir Valley and Baloch population is also very small.In some remote places,signs of British are still visible! True . The population of the Valley is around 7 million spread over a smaller area geographically as opposed to a similar population in Balochistan distributed over a wider area . We need to find more innovative tactics to make the PA bleed like we're doing in Kashmir .